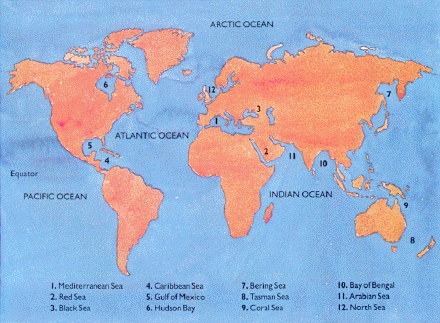 How many oceans are there in the world? This question may not be as easy to answer as you may think. First we need to see the origins of the word ocean. The Ancient Greeks gave us the word ocean and it described what was to them the outer sea that surrounded the known world. Even then the ancients later believed that there were only 7 seas, the Mediterranean, the Caspian, the Adriatic, the Red Sea, the Black Sea, the Persian Gulf and the Indian Ocean. The number of oceans in the world varies on how you look at it. From the scientific point of view there is only one major ocean called the World Ocean and if you include inland seas such as the Black Sea and Caspian Sea there are 3. The scientific method of counting oceans looks at saline bodies of water that have oceanic crust. Another way to look at it is to divide the world ocean by the different continents and other major geographic regions it touches. Using this method there are 5 oceans. There is the Atlantic Ocean which separates the American Continents from Europe and Africa. Then there is the Pacific which separates Asia and the Americas. The Southern Ocean is tricky but is named as such because it encircles Antarctica touches Australia and the southern end of South America. The Indian Ocean is named after Indian subcontinent. The Arctic Ocean is named for its location north of all the continents and being the North Pole. Originally only the Southern Ocean was not officially recognized so this only demonstrates how the designation can easily change. The way you count the oceans can vary depending on your profession or understanding of the Ocean. Either way you look at the large bodies of salt water are very important. They are a major source of food, regulate the Earth’s climate and are the major source water for all life. So in the end it becomes not so important to know how many oceans there are but what the ocean is and how important it is to life on this planet. If you enjoyed this article there are several other articles on Universe Today that you will like and find interesting. There is a great article on sea floor spreading and another interesting piece on ancient oceans. You can also find some great resources on oceans online. You can learn more about oceans currents and how they affect climate. You can also learn about Ocean Biomes on University of Richmond website. You should also check out Astronomy Cast. Episode 143 talks about astrobiology. Next PostNext What is Dark Matter?